Have a seat and enjoy "Milwaukee Poop Poop Poop Song!" Once the holidays have come and gone, it’s easy for people in and around Milwaukee to get caught up in winter “woe is me” talk, when we all just want a little sunshine to get through the day. But this is where we’ve decided to live, people, so we might as well make the best of it. Fortunately, there are some fun activities and celebrations to make that possible. Check out these awesome, cheery, festive events and activities you can do this winter to help you make it to spring in one piece. Milwaukee County Parks has a great list of places to go sledding, which even includes a few lighted sledding hills. If you want to raise the stakes, check out tubing at The Rock complex in Franklin. Every Friday and Saturday night they have adult tubing from 8:30-10:30 p.m. It’s $30, which might sound like a lot, but the price includes all-you-can-drink domestic tap beer. One of the best perks of living in Milwaukee is having access to free outdoor recreation equipment from the Urban Ecology Center. What’s the catch? You have to be a member. Luckily, it’s only $35 per year. Become a member and borrow snow equipment to hit the region’s many trails. Come summer, you’ll be all set to borrow camping equipment. If you have your own skates, you can skate for free at the Slice of Ice rink in Red Arrow Park. Skate rentals are available, too. It’s open pretty much every day all winter long. Just to be sure, you can check out the hours and rates before visiting. Yes, you really can get a taste of the Iditarod right here in Milwaukee. Door County Sled Dogs‘ rides and times are limited, so get in contact with this organization early to make your reservation. A kid ride is $15, while adults ride for $20. Third Ward’s Gallery Night And Day is a good event if you need to take need baby steps to spend time outside again. You’ll have the nice warm galleries and bars to duck into as you bounce from place to place. Even so, you’re still getting out and about, and even grabbing a little culture along the way. Before you go north of the city to celebrate winter, first head west to the popular Janboree event held in Waukesha. They don’t mess around with this festival, and it’s not called “Wisconsin’s premier winter festival” for nothing. There are fireworks on the opening night, and you’ll find all sorts of activities during the weekend, including ice fishing, horse drawn wagon rides, concerts, and more. Check out all the events, and sign up for the ice bocce ball tournament while spots still remain. This unabashed family-friendly event will give you an excuse to get outside during the cold days of late January. The Winter Carnival includes wagon rides, hikes, and an owl meet and greet. Cost is $10 per person ($5 for kids), or $5 for the nature center’s members. Schlitz is a bit off the beaten path, but it has one of the coolest outdoor towers in the area, and it’s right on the lake. Running isn’t just a warm-weather activity. Those crazy runner types have decided to make it a year-round activity, and they even have events to match. There’s a winter run series happening right now, and you can still sign up for The Big Chill, Cupid Shuffle, or Luck of the Irish. Check them out. Okay, so this one takes you a bit out of the city, but it’s a sanctioned national competition happening right in Wisconsin. 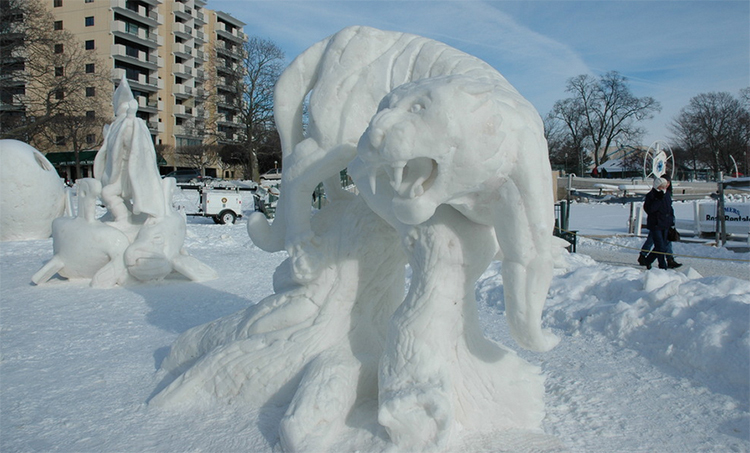 You won’t believe the crazy art that can be created out of snow and ice. It’s one of those things you’re going to want to say you did at least once. 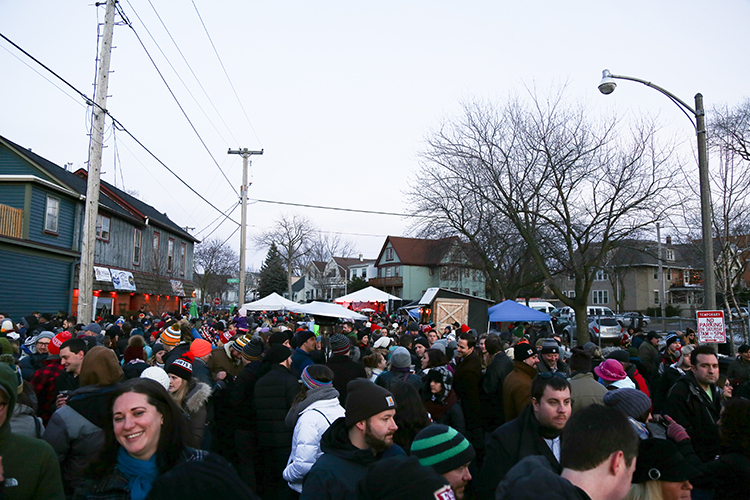 This festival proves that Milwaukeeans will drink anywhere, even in snowy subzero conditions. This year will mark the 5th anniversary of Mitten Fest, which includes booze, beer, and great music. Don’t forget this is a charitable event, so bring some non-perishables and winter clothing for the Hunger Task Force. Believe it or not, Cedarburg knows how to throw a proper winter festival! At the 43rd annual Winter Festival, you’ll find all kinds of seasonal pastimes, such as chili making, ice carving, barrel racing, and even a golf tournament. Plus, there’s a parade, a pancake breakfast, as well as a beer and wine tasting. It’s definitely worth a drive north for the day. Stacy Tornio is a nature and gardening nerd, living on the edge...of Bay View. She's written more than a dozen books about gardening, nature, and other geeky outdoorsy things.